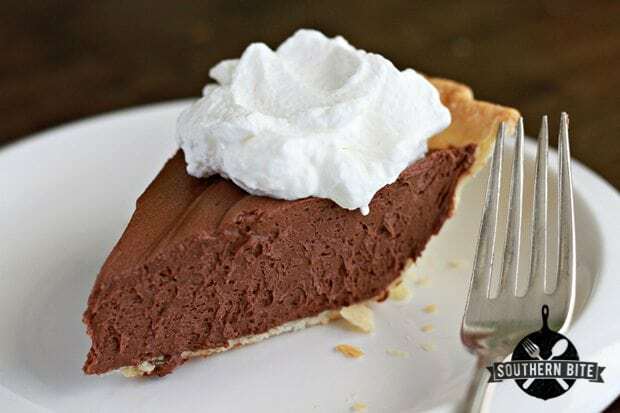 This is by far one of my most favorite pies, but I have hesitated adding it to the recipe collection here on Southern Bite for two reasons. First, it takes a little while to make and if you don’t have a stand mixer you might end up hating me. The other reason is that my original recipe calls for raw eggs. And while I’ve been eating pies and ice cream with raw eggs in them for years – it hasn’t killed me yet – I realize that older folks, babies, and others with a compromised immune systems should avoid them. Well, I’ve got some good news and bad news. The good news is, if you’re not keen on raw eggs, you can try this new recipe that uses pasteurized eggs. I used the store brand of Egg Beaters. It’s pasteurized so it’s much safer to consume without them being cooked. The bad news is that you still have to stand over the mixer for 15 to 20 minutes, but the result is the most velvety, smooth pie you’ve ever imagined. One taste and you’ll see that the time put into it was totally worth it. 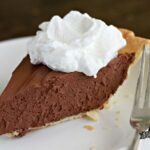 It’s great by itself, but top it with some fresh whipped cream and as my sweet great-grandmother used to say, “It’ll make your tongue slap your brains out!” Y’all enjoy! Bake the pie crust per the package directions. In a microwave safe bowl, melt the chocolate in the microwave using 30 second intervals. Heat until the chocolate is almost completely melted, then stir until the rest of the chocolate melts. This helps to prevent the chocolate from scorching. Set aside to cool. In the bowl of stand mixer, combine the butter and granulated sugar. Beat on medium speed until fluffy. Add cooled chocolate and vanilla and beat until combined. Slowly add 1/4 cup of the pasteurized eggs to the mixer while it is beating and beat for 5 minutes. (Yes, 5 whole minutes.) Turn the mixer off, scrape down the sides, return the mixer to medium speed and then slowly add the other 1/4 cup of eggs to the mixer as it is working. Beat for another 5 minutes, or longer if the mixture isn't light and fluffy. Pour into the prepared pie shell and refrigerate for at least 2 hours to allow the pie to set. Serve with fresh whipped cream. In a stand mixer, add cold whipping cream to the bowl. Whip using the whisk attachment. When the cream begins getting foamy, add the sugar. Continue to beat until stiff peaks form. Keep refrigerated. While the recipe calls for the use of a stand mixer, a hand mixer works just as well. You'll just need some patience and maybe an extra hand to help hold on to that mixer for the 15 minutes it takes to come together. I’m so glad you decided to share this recipe, your pie looks incredible! I have made this recipe countless times since 1968 when a friend from Richmond, VA gave it to me and swore that her mother “bought the recipe” from the chef at a Richmond Department store after she enjoyed it so much in their tea room. True or not, it has remained one of my all time favorites, and I’m so glad that you have included it on your wonderful blog site. So, the recipe is at least 45 years old. I’d like to know its origin…just for interest. I just discovered your blog this morning! Welcome, Bobbie! I’m so glad you found me. I bet the history is quite interesting. This is truly one of my most favorite desserts. My mother and I made a lot of shopping trips to Richmond, and always had lunch at the Miller & Rhoads Tea Room. Turkey Pot Pie was our usual lunch there, but Chocolate Silk Pie was our favorite dessert! That was back in the mid ’60s. The VA Egg Board, out of Roanoke, VA, has posted articles on the recipes from Miller and Rhoads. This looks AMAZEBALLS!!! Can’t wait to try it! This looks really yummy! We have a recipe similar to this, but we seem to be having trouble with it being grainy. Any suggestions? WOW! I’m drooling over this, and I’m not even Half the chocoholic my hubby is. This will be the first recipe I try WHEN I get a stand-mixer! I hope y’all enjoy it! It’s one of my favs. This pie looks soooooo gooooood. I tried to email it to myself because I can’t copy and paste but it wouldn’t let me click on the envelope but it wouldn’t let me, it keeps talking me to pinterest or however its spelled, lol. That’s strange. The best bet is the pin it or to print it. I’m not having any trouble on my end emailing it either. This sounds amazing. If I wanted to make the original recipe with the raw eggs, how many eggs do I use? Thanks Stacey. I love your blog! Thanks, Kasey! It should be about 4 eggs. I was really looking forward to trying this recipe but it has me a touch confused. It says in the method to melt the chocolate (which is included in the ingredients), then add the rest of the chocolate melts – but they aren’t mentioned anywhere in the ingredients list? Also what is the pasteurised egg product?! It is not a common ingredient here – none of my friends have ever heard of it. Is there a widely used alternative that I could use instead? Hi Tracie! Sorry for the confusion, but there are is no additional chocolate or chocolate melts. The recipe calls for you to melt that chocolate almost all of the way (there will still be some lumps) then to stir it until the remaining chocolate melts. This prevents you from scorching the chocolate. Doe that make more sense now? I already understood the reasoning behind melting the chocolate – it was the reference to the chocolate/chocolate melts that confused me but it has now been clarified. However I also asked about the pasteurised egg product? In the States there is a brand called Egg Beaters. It’s pasteurized eggs. We Americans can be weird about eggs. My family isn’t. You can make it with 4 large eggs rather than the egg product. Enjoy!